Hello and welcome to my little corner of the crafting world! I hope your week has been going well for you so far. Are you ready for all the little trick or treaters? I can't believe that it's Halloween and here I am posting a Christmas project! But, I know I better get a move on, because Christmas will be here way too soon! 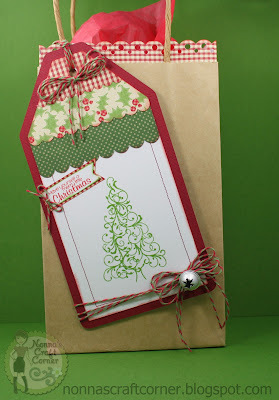 * I started with a plain Kraft bag - I used a paper punch and the pretty gingham paper to dress up the top of my bag. * I added some great "Holly Berry" twine from Trendy Twine and a jingle bell to finish up my tag. That's it for me today! Thanks for stopping by and I hope you have a wonderful, safe Halloween tonight! Enjoy those trick or treaters and don't eat too much candy! What a GREAT gift tag!! LOVE that fancy tree and the beautiful papers and embellishments!! Beautiful tag!! This and the trim on the edge are a wonderful way to dress up a bag!! Always a treat to come visit you:) Great job! Tanya ~ What a FABULOUS gift bag!! LOVE the tag and how you used the punch for it and around the inside of the bag! I need to try this! Hey you are NEVER to early for Christmas projects~ it creeps up so fast!! LOVE it as usual and Happy Halloween!! We will be having our trick or treating on Saturday! Sandy is still raining on us here!!! YUCK! How cute is this bag! I love the border punch at the top - pretty neat! Oh no....... more JB stamps, they are so cute!!! I'm placing an order tomorrow :) thanks for the inspiration my friend! Love, love, love this! Never thought about a border around the top - fantastic! And I love the twine and bell. This is just a delightful project. Love the idea of the border at the top of the bag. Your tag is beautiful. Just love you gift bag!! Love the layers on the tag and the little bell you added!! Beautiful tag! I love the twine and the jingle bell is the perfect touch! Love it! "EMMA and Nonna's Craft Corner"